Salmon with Tomato Corn Salsa - An Easy Summer Seafood Dinner! Salmon with Tomato Corn Salsa - An Easy Summer Seafood Dinner! 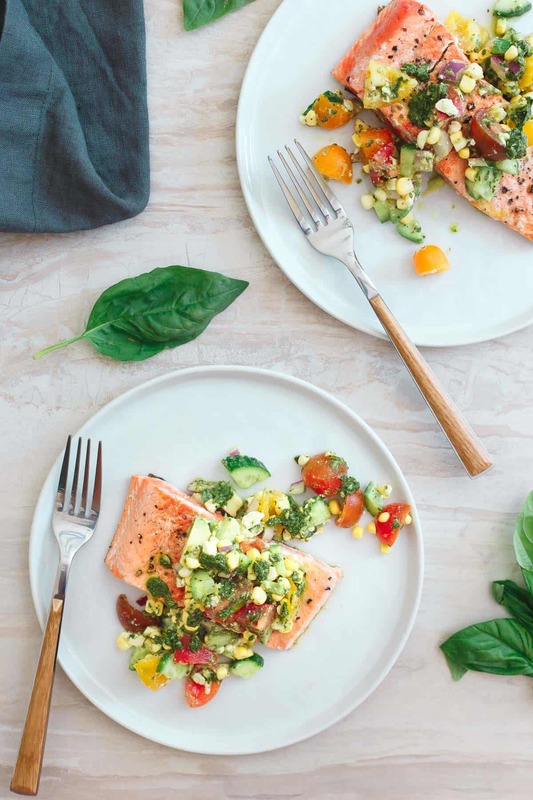 This salmon with tomato corn salsa is quickly seared on a hot skillet and served with a refreshing salsa bursting with summer produce! Watch the video of how to make this easy, quick and healthy seared salmon with tomato corn salsa below. It’s been 12 years since I dealt with a bridal registry (ugh, what a process that was) but I still distinctly remember at the time being completely overwhelmed with the pure quantity of choices when it came to knife sets. Did I really need a set of knives with a block that cost half as much as a mortgage payment? That seemed excessive at the time. *This post is made in partnership with Kamikoto. Had I been able to look into a crystal ball and see future me, 12 years down the road making a living off of cooking every single day, I think that decision would’ve been a little easier made. Sharp, quality knives make all the difference in the kitchen. It’s the first thing I notice when I’m in someone else’s kitchen and usually the first thing that makes me nostalgic for my own because there are so many people out there with dull knives! That first cut after having my knives sharpened is always so incredibly satisfying. You know you have a good knife when cutting through tomatoes or raw fish feels like butter. Both those things were among my first tests for these Kamikoto knives when they sent me their Kanpeki knife set to try out and I can definitely say they passed with flying colors. The slicing knife has become my go-to for all meat and seafood while the utility knife barely leaves my cutting board. Between summer fruits and my daily salad toppings, that knife gets a workout lately. Kamikoto knives are made from high-quality steel sourced in Honshu 本州, Japan. The blades are handmade by a select group of experienced craftsmen in Yanjiang, China – a town with over 1,000 years of knife and sword making heritage. They’re as strong and durable as they are beautiful and while slightly heavier than my other knives, they make quick work of whatever kitchen test you put them to. 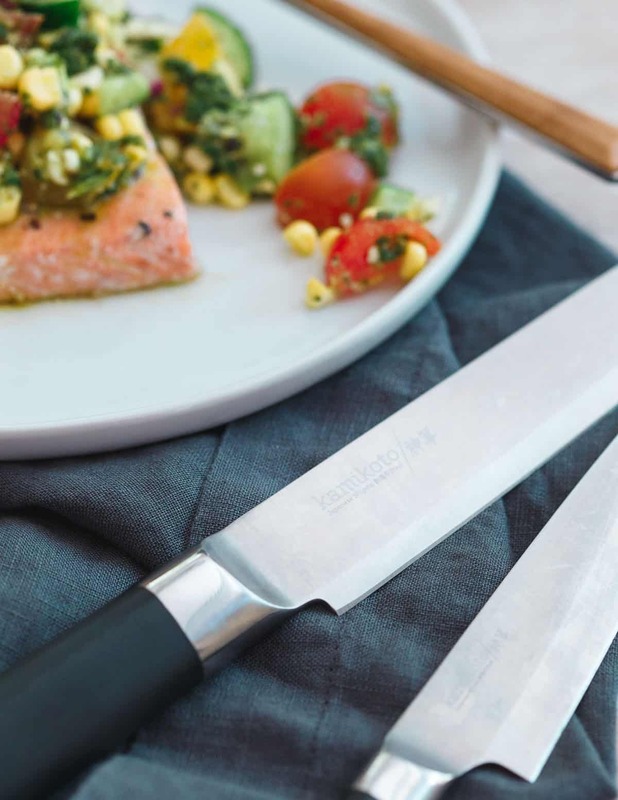 This seared salmon with tomato corn salsa seemed like the perfect seasonally appropriate way to showcase the knives. The slicing knife had no problem cutting through a large, skin-on salmon filet while the utility knife tackled the tomatoes and avocado in the summer salsa with ease. We eat a lot of salmon in our house (see tart cherry glazed salmon, sriracha honey salmon vegetable packets and blackened salmon tacos for some of our favorites) so I’m always looking for new ways to change it up based on the season. This recipe uses a simple skillet sear with minimal seasoning (just salt and pepper!) 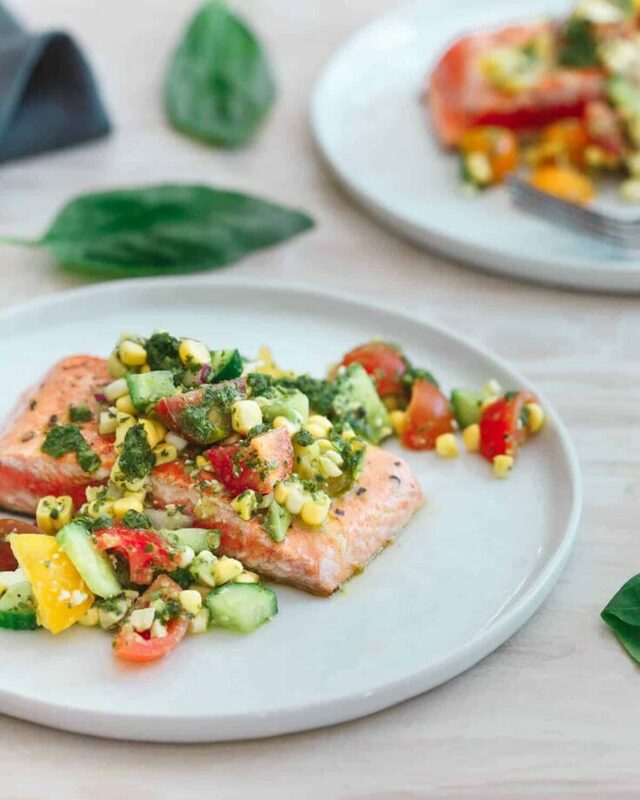 for the salmon and leaves all the flavorful additions to the summer tomato corn salsa and basil vinaigrette. When sweet corn is good, it’s good. I love eating it raw off the cob as those sweet, juicy kernels just pop in your mouth. There’s literally no need to cook it when it’s like that. Of course, you can always make this sweet corn egg drop soup too or even this sweet corn bacon ice cream <–SO good! Combined with perfectly ripe tomatoes and a tangy basil vinaigrette, this salsa is so packed with summer flavor you could eat it by the spoonful or with some chips/crackers too. As a quick, easy and healthy dinner option though, it’s delicious over the seared salmon. Love this salmon with tomato corn salsa recipe? Combine all ingredients in a food processor and process until well combined. Set aside. Place a cast iron or heavy bottomed skillet over medium-high heat. Melt ½ teaspoon of the coconut oil in the skillet. Place 1 salmon filet in the skillet, skin side down. Season the flesh with salt and pepper. Cook 2-3 minutes until skin starts to turn golden brown and crisp up. Flip and cook an additional 1-2 minutes so that the flesh side gets crispy but the center is still medium rare. Time will vary depending on thickness of the salmon filet. Repeat with remaining 3 filets, using ½ teaspoon of coconut oil to sear each time. Prepare the salsa by adding the tomatoes, corn, red onion, feta, cucumbers and avocado to a bowl. Season with salt and pepper to taste. Pour ¾ of the basil vinaigrette into the bowl and toss until well combined. Serve the salmon filets with the salsa and drizzle with remaining basil vinaigrette. Love this so much! Salmon & fresh corn salsa what a perfect meal. Obsessed with that basil vinaigrette and salsa!!! Oh my gosh, I seriously need new knives! These sounds great – and so does this salmon! YUM! Love the flavor combination, can’t wait to make this over summer! Gina, I cannot wait to try this! and those Kamikoto knives are everything! Beautiful! So many flavors happening here, this is the perfect summer dinner! So fresh and simple, can’t wait to make this for dinner! Corn adds the perfect sweet touch. Thanks! This is totally my kind of light and fresh summer meal Gina! Love that corn salsa! Loving this fresh recipe! Salmon and corn salsa is perfection! K but like I need to get my hands on these knives. Absolutely amazing! I love corn salsa. Pairing it with salmon is sheer perfection. This looks absolutely amazing. Quality knives are something my kitchen is totally lacking *hangs head in shame* These look amazing. And so does this salmon! I love salmon and corn salsa so much, I can’t believe I’ve never thought to pair the two! Beautiful. This is my kind of recipe! I love the touch with the basil oil. We are allergic to coconut, what oil do you suggest we use instead? any other cooking oil you normally use then is fine. I would probably use extra virgin olive oil.